25% Off Leather & Suede Coats too! And best of all, there’s no limit to how many you can bring in. Drop your coats off to any Puritan Cleaners location on February 20th and 21st and take advantage of these great savings. *Prize awarded in the form of ALDI Gift Certificates. Based on a household average of $10 per week spent on produce at ALDI. One winner per participating store. See store for sweepstakes rules and details. Stores open at 9am. $10 off $40 purchase coupons have gone out again, via mail and/or this week’s Aldi circular delivered with the newspaper. ::Drumroll:: The first Richmond region Aldi grocery stores will open on April 23 on Parham Road in the West End and on Charles Dimmock Parkway in Colonial Heights. Admit it, who else plays “chicken” with their fuel tanks, getting as close to empty as possible so you save the most with your fuel points? I took the above “empty” photo last March when I rolled into a Kroger station for a fill-up. I’ve been seeing a lot of friends’ photos of sub-$1 a gallon fillups lately! – 1 fuel point for every $1 in groceries purchased, redeemable in nearly all supermarket fuel centers and convenience store locations. – Most gift cards earn double points every day – for every purchase of $50 in gift cards from Kroger’s Gift Card Mall, customers receive 100 fuel points. Customers can also earn double fuel points on No-Contract Wireless Phones and Airtime Cards. – Every qualifying prescription earns customers 50 fuel points. What’s better than cheap gas? Free gas, of course. If you’re going to be showing off your savings, you might as well enter to win $200 in free gas at the same time! Kroger is offering Richmond Bargains readers a chance to win a $50 Kroger gift card! If you can’t see the widget, click here to find the entry form on Rafflecopter.com. Terms & conditions: One entry per person. Deadline is February 21, 2015 at 11:59 p.m. EST. One (1) winner will be selected at random and notified via email. Winner will have 48 hours to respond with his/her mailing address, otherwise a new winner will be selected. Kroger is providing and fulfilling the prize; I received no compensation for this post. * Alison’s note about number of winners: I believe 44 is the total across the whole group of 11 Kroger brands (like Dillons, Frys, etc.) Out of folks that shop at Kroger, like us, there will be 4 winners, one each contest period. Two stores actually, one in Midlothian (Stonehenge Village Shopping Center, on Midlo Tpke near Chesterfield Towne Center) and one in Short Pump (West Broad Marketplace past Short Pump Town Center). Opening dates have not been set yet. See the press release for more details. I know some folks love them; I’ve never shopped there before. So Wegmans experts, what should we expect? Sunday’s Kroger sale circular announced a change to the grocery chain’s sale circular schedule: beginning March 5, Richmond Kroger’s weekly ad – and corresponding sales – will begin on Wednesdays (instead of the current day of Sunday. Martin’s remains Sunday to Saturday for the moment, Food Lion follows this Wednesday to Tuesday pattern). The print ad will be distributed in Wednesday’s newspaper and available online. You’ve been wearing your coat for a couple of cold months and it needs a good cleaning. Here’s your chance to save some money too. And best of all, there’s no limit to how many you can bring in. These prices reflect a 40% savings off of the regular cost. Drop your coats off to any Puritan Cleaners location on February 17th and 18th and take advantage of these great savings. For the fifth year in a row, Puritan Cleaners is conducting a one-day-only event that offers everyone in Richmond a free cleaning of one pair of pants. 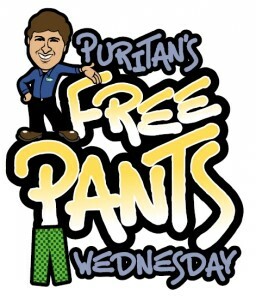 The event, called Free Pants Wednesday, will be held on Wednesday, August 28, 2013, and the offer is good at all 13 Puritan locations throughout town.